Rewards Canada: August 25 Update: Combine the BMO AIR MILES World Elite 25% discount with the companion ticket offer, KLM Dream Deals & more! August 25 Update: Combine the BMO AIR MILES World Elite 25% discount with the companion ticket offer, KLM Dream Deals & more! 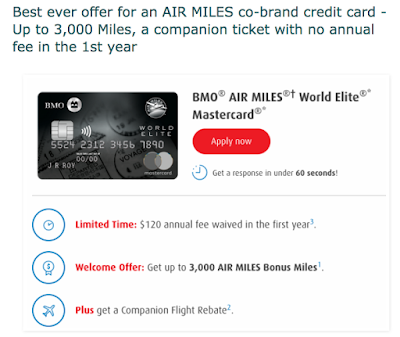 To confirm, a new BMO AIR MILES World Elite MasterCard Cardholder can use his North American flight discount in combination to this promotion. The discount is applied when they book both their flights. So the answer is yes you can take advantage of the discount on the companion ticket offer! This makes the offer even more compelling as you are getting two flights in North America for only 75% of the cost of one ticket! Thanks to Jim for posing the question! KLM's Dream Deals are back! Flights to Europe start as low as $718 all in for Economy Class and $2935 for Business Class! Book by September 14, 2017. Travel between September 11, 2017 and June 1, 2018. Find out more here!